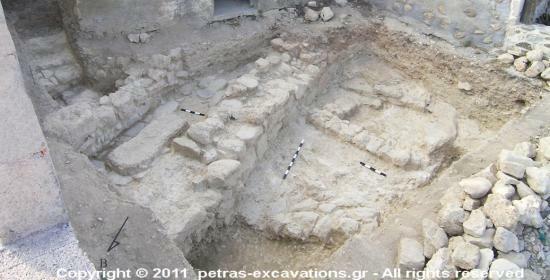 Three plots were excavated near the fenced archaeological site of Petras in 2007. Architectural remains dating from EMIII/MMIA to MMIII (rooms and floors), a LM I retaining wall along with two smaller ones of similar function came to light in a plot (Hill I). A LMI lentoid seal with the depiction of a woman figure and an animal was an important find. Architectural remains (Minoan-Byzantine period) were brought to light in a plot (Hill I). They belong to the Neopalatial settlement, which was not limited on the summit and the slopes of the hill, but extended to the coastline. Another interesting find was a rectangular construction with floor lined with plaster, probably dated to the Byzantine period. The plaster lining probably suggests an industrial use, related to the production and storage of oil or wine, similar to the Byzantine cistern found in an adjacent plot. The pottery belongs to the Minoan, the Roman and the Byzantine periods. Architectural remains, dated to the Neopalatial, the Roman and Byzantine period, were revealed in a plot (Hill I). They include Neopalatial architectural remains, part of a Roman drainage system and a Byzantine cistern for oil or wine with plaster lining. 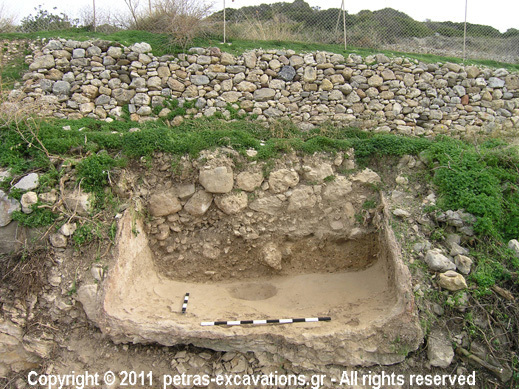 The cistern suggests activities related to the production of oil or wine at Petras in an earlier period (maybe Protobyzantine). The drain adds new evidence for Petras during Roman period, which was known only by one or two tombs, excavated in the 1970’s in the area of the modern settlement of Petras.